This Saturday, Oct 21st we are holding an open Executive meeting in the clubhouse at 10am to give all our members the chance to learn more about how our club is run. All Adult members - and parents of members - are encouraged to come along and find out what work our Executive Committee does. The AGM will be held on Thursday 30th November in the clubhouse. All adult members are encouraged to attend and have their say in how our club is run. D-day is fast approaching as our juvenile section get ready to fly the Scoil colours further afield. Saturday the 28th of October will see 150 of our Juvenile players and parents head north to Belfast and then on to Scotland where they will be partaking in a weekend of football and fun. The group will travel to Belfast where they will play a game against St Paul's GAA, then take the ferry to Cairnryan and travel to Ayr in Scotland. After an overnight stay they will then travel to Glasgow to play Glasgow Gaels. 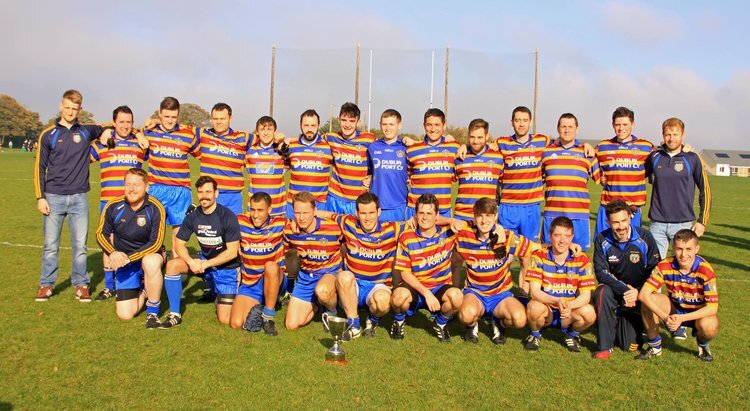 Congratulations to our AFL7 Footballers who beat St James Gaels last Sunday Morning in their league Semi-Final. This win guarantees their spot in the playoff final which will see them battle for promotion to division 6 with Thomas Davis on October 19th @11am in Kiltipper Rd, however as this clashes with the AFL2 playoff semi, please watch this space for a change. Saturday saw our Mothers & Others put their skills to test in the G4M&O Blitz in Portmarnock. Our Scoil Sirens looked the part in their new gear. Special thanks to the coaches - Nicole, Sinéad and Molly who have been putting these Ladies through their paces every week! From Saturday mornings spent chasing screaming children in our Nursery to recruiting new members for our G4M&O, this man is a very welcome addition to our club! Not really, school friends still call me Darc. I’m from Portmarnock but live in Killester now. My kids go to Scoil Neasain and Scoil was recommended (mandated) by Ciara Crowe Leahy. My second week in Scoil I lingered just the little bit too long at the hurling barrel and John Kelly shoved a hurl in my hands (size 20) and I’ve been helping out with the nursery ever since. The Nursery. We spend Saturday mornings chasing screaming kids around the pitches. Convincing Aedamar (my wife) to join the Scoil Sirens (G4MO). I’m COO for Anam Technologies a Telecommunications Software company. Being a big Dubs fan means Saturdays for Scoil and Sundays for Croker for most of the summer (long may it last). A indoor facility for winter training and good all-weather pitches. Definitely the jersey. It’s really unique and really identifies the scoil brand. A thriving club playing Senior Football and Hurling and with successful ladies football and camogie teams. I don’t know but an internet quiz told me I’m a fox. Our PRO Team is Expanding! As we continue to look at ways to improve how we do things in Scoil, we have expanded our PRO (i.e. 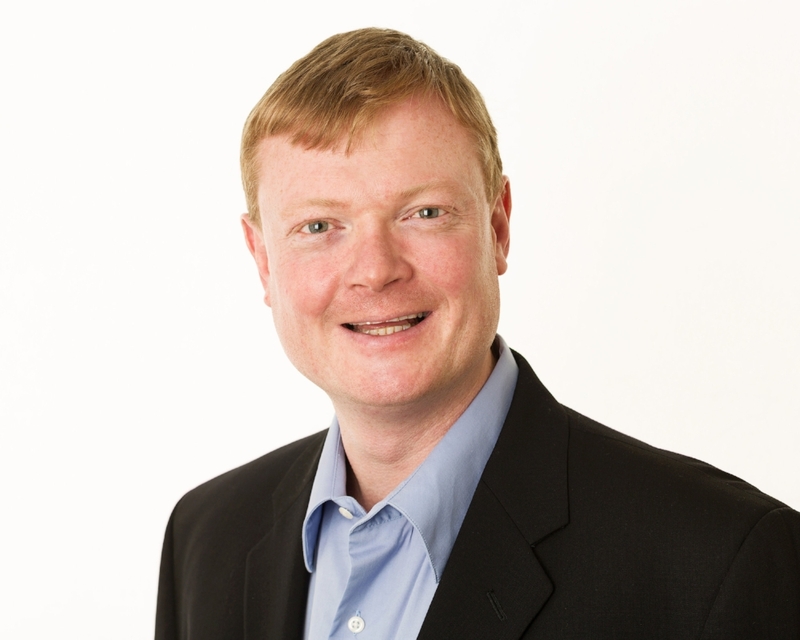 marketing) team and Alan is now being assisted by Molly Power and Gráinne Egan in creating the weekly newsletter. Please send us on any club related news and updates so we can keep all our members up to date with the great work going on in our club! Any news or items to be included in the newsletter should be sent to the PRO inbox (scoil.pro.eoc@gmail.com) before 12pm on Tuesday. AFL2 beat Tempelogue Synge Street in final AFL2 game and and will now play Na Fianna in the promotion playoff semi final on October 19th @11am in Scoil. The Scoil Ui Chonaill Sirens Gaelic 4 Mothers and Others team (GAA for Ma's!!) took part in the LGFA All Ireland Blitz Day in Naomh Mearnog last Saturday the 14th of October. There were 200 teams from all over the country with approximately 2000 women playing. 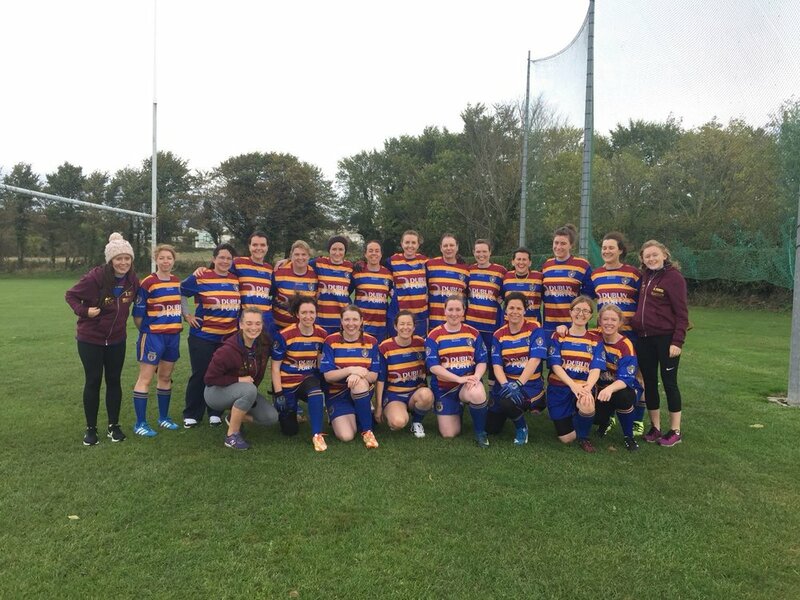 The team played five matches throughout the day against Aghaderg, Co. Down, Balyna, Co, Kildare, Annaduff, Co. Leitrim, Walterstown, Co. Meath and St. Dominic's, Co. Roscommon. The Scoil Sirens showed off the range of skills they have learned this year as all the panel have only started to play football this time last year. Scoil more than held their own and with great support from all the panel and supporters the team got stronger with every game and certainly had the most vocal supporters on the day with scores being met like ones from Croke Park. Many thanks to all who came out and supported the team on the day and to the LGFA, Naomh Mearnog and St Sylvester's club for organising a great event. The year has been an exciting one for each and every team member, ably mentored by Scoil Senior Ladies Nicole Rock, Molly Power and Sinead de Burca. Thanks to all in the club for all the support including the financial sanction for jerseys. They were very distinctive on the day. If anyone is looking to get involved please talk to any team member. The next outing for the Scoil Sirens is an invitational blitz in November to Binn Eadair. The Scoil Minor team played their B Championship Football Shield quarter final last Sunday 15th October in Sean Moore Park against Parnells. Half time left us 6 points down but we drew back level only to have Parnells score a goal and a point in the last couple of minutes to win the game. The team still has a football league semi-final as well as a B Championship Hurling Shield quarter final to play – dates to be confirmed. Scoil entertained Binn Eadair & Raheny GAA on an extraordinarily warm morning & didn't disappoint. Both Team Jp Courtney & Liam Ryan finished the day with 100% wins in our x6 games & bragging rights well deserved by the kids. Fantastic achievement from the Scoil lads, given strength of opposition. Every kid enjoyed receiving their medals, Crisps & drinks. G.R.M.A. Excellent effort put in by Liam Ryan to get pitches/overflow car park ready & Ronan Murphy for stepping in as last minute referee also. Great to hear Friday night's Scoil Hurling Development training with Thomas Gleeson G.P. O. & Co was a roaring success (despite the horrendous weather) with plenty of U10's availing of the additional skills training. Scotland Juvenile Trip to Scotland less than 2 weeks away.....Pics of those travelling from U10 panel below. The boys had a home game against Raheny on a balmy October morning. We fielded 2 teams of 9 a side with a little help from a couple of under 8s and under 10’s. Raheny are traditionally a strong team with good numbers to select from. Whilst they won both games the scoreline flattered Raheny somewhat as they got a few handy goals from a slow Scoil start and some misplaced kick outs. The scoreline aside it was really positive to see the boys preforming a much higher level than a few months ago and doing on the pitch the things they have been working on in training. Some of the lads probably even surprised themselves with their level of tackling, blocking, etc. Team Brendan and Colin – top scorer was David who ran the show in midfield in the second half chipping in with 1-2 well supported by Temi who scored 1 goal. Up front Noah scored 0-4, well supported by Ruairi with 0-2 and Evan. After a slow start where we conceded couple of goals from poor kickouts from an injured goal keeper Conor Meehan who soldiered on regardless, the defensive line of Eoghan Og, Cody, Calum and Luke put in some great defensive tackling to keep Raheny at bay. 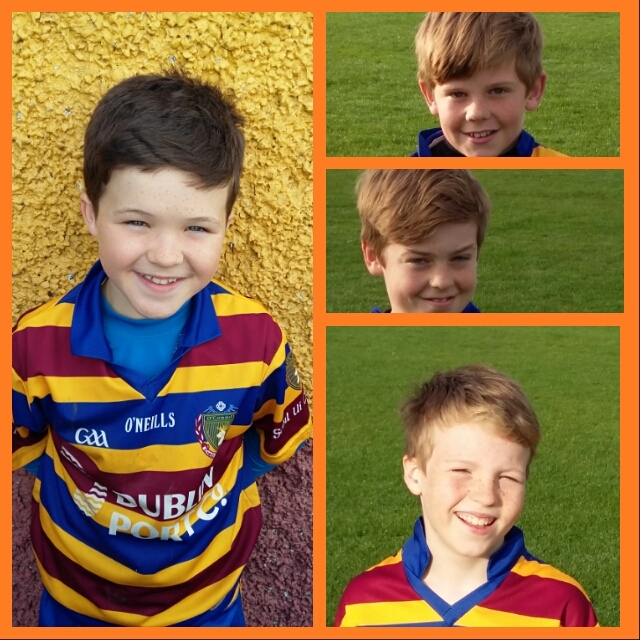 Team Alan – we had a bit of help on this team from the under 10s Tadhg and Fionn who in the second half in particular helped even things up against a strong Raheny team. 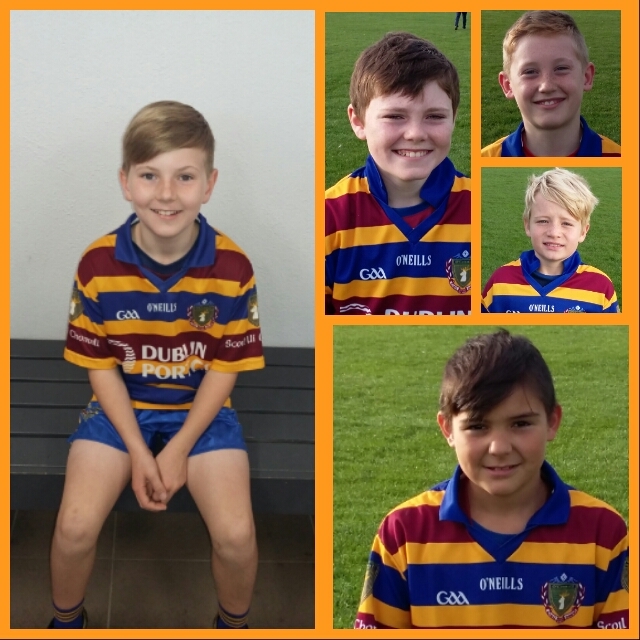 Saoirse, Isaac, Senan, Jake, Joe, Cillian and Paddy worked tirelessly and put in some good tackles and blocks and scored a few points between them. It was an all around good team performance and team spirit was very much in evidence despite the scoreline and Rahenys strength. Next up is a Wednesday night hurling training and a hurling game against Bray Emmets on Saturday 21st October. The U9 girls played away to Na Fianna in a Camogie Blitz on Sunday morning. Our 2 teams played a total of 6 matches against 3 teams from Na Fianna and all games were very closely fought. It was great to see a noticeable improvement in our ground striking thanks to the excellent recent sessions with Joan Cushen. The skills are really improving with every match but as always our battling qualities were our biggest asset. Football match this Sunday at home to O’Tooles at 10am. 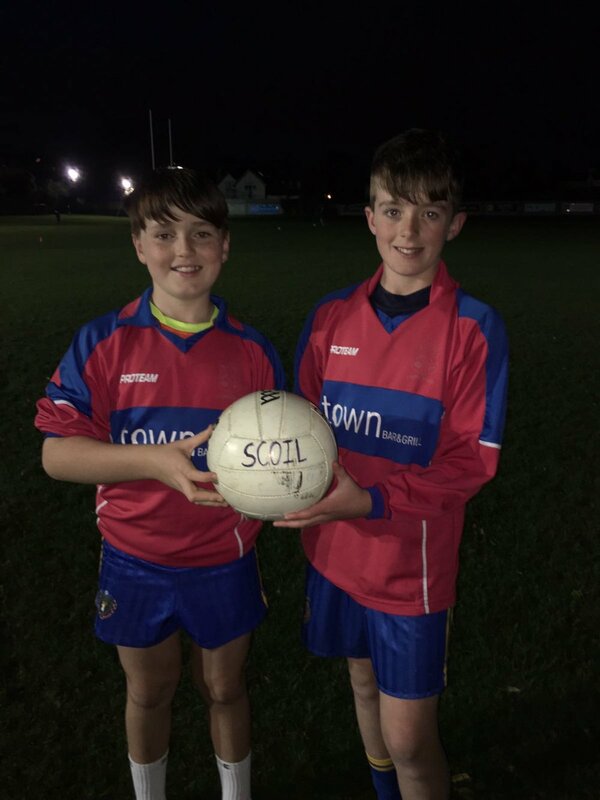 After a very good training session last Saturday, Scoil Academy (kids born in 2010) will play Beann Eadair and Naomh Barróg in both football and hurling this Saturday. This will be third (and final time) we will play these teams this year and it has been a great opportunity to see how our players were progressing throughout the year. There has been great support provided by parents and family so far this year and it is much appreciated by the players and coaches. Final details regarding time and venue for this Saturday will be sent through the whatsapp group. Scoil Nursery enjoyed a great turnout last Saturday with all players being put through a range of activities to help them enjoy the morning while learning key skills. The participation of parents is greatly appreciated and everyone is encouraged to help out at anytime. Congrats to our players of the week and as always new players are welcome to join in and have fun this Saturdaymorning at 10am.